I changed some elements of the list. I wanted some shooting, so I add a Blitzer accompanied by Brawler. I sent Horthol on the bench and put a Champ Hero in his place. Maciej won the roll and decided to go 1st. I choose the side with rubble and wall. 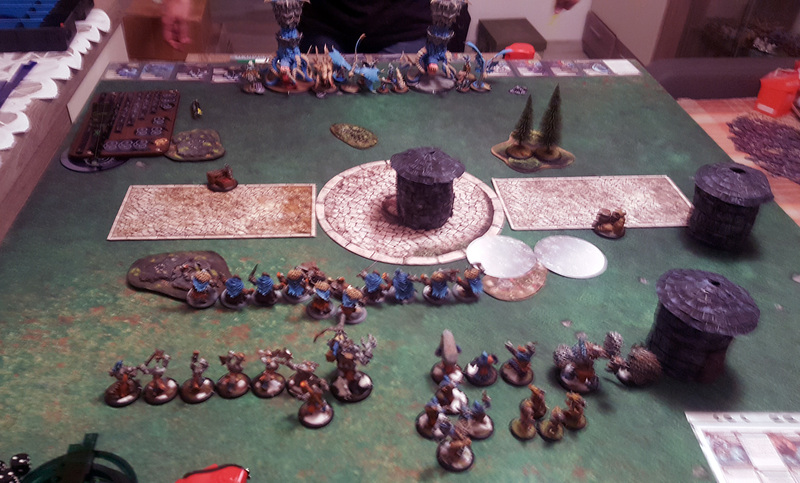 Maciej put Occultation on left Hellion, Admonition on Scythean and run/charges with all his forces. I started with both Bears units in ambush. Raiders run widely to block enemies. Champions with Hero positioned on the hill. Blitzer and Fell Caller moved befind the wall. Stone awakens and put aura, movind a little forward. Calandra cast Star Crossed and Bullet Dodger on Brawler (she can free upkeep it on him, because Brawler is Northkin) and charges to the rubble. I felt pretty safe in rubble, with 2 Raiders in front and Valka nearby ready to countercharge. 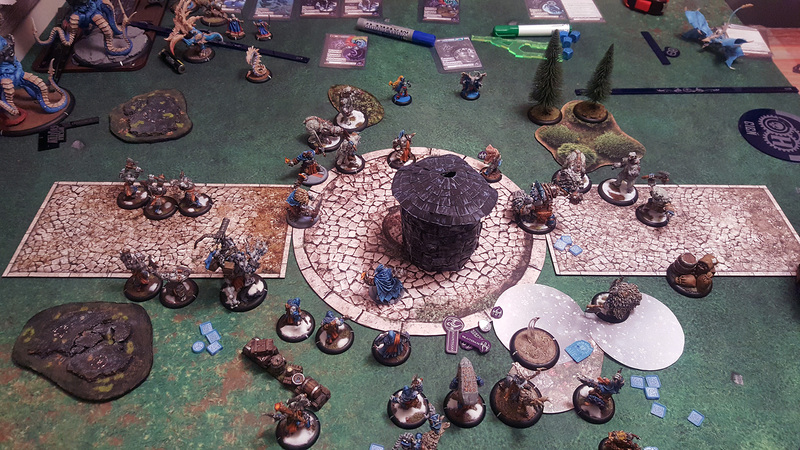 Maciej however wanted to test if he can do caster kill, but we assumed to pause a game and go back after that. It turns out that with Vyal2 feat CK was successful. I dont remember excacly what was in what order, but he used Throne, Chasten, Icy Grip, probably Naga animus and Angelius. Calandra fall dead. And then we got back to our previous state 🙂 Maciej cleared some Riders, charges with Scythean toward Blitzer and killed some models. Left throne attacked too. Maciej had poor rolls and did kill that many Trolls as he wanted. In respond I ambush with both units of Bears. Piggies crafted talisman for my warlock. Calandra FEATed cast Bullet Dodger on herself, cast Star Crossed, and stood in the rubble. She also cast Beffundle on the Angelius to the right, moving him in range of ambushing Bears. Runebearer did the same with left Throne, putting him in range of left Bears. I managed to clear Throne, Angelius, Scythean and 2 Blackfrost Shards (with Blitzer). I also destroyed objective with Champions and score 2 points (2nd one from the right zone). Legion turn 3. 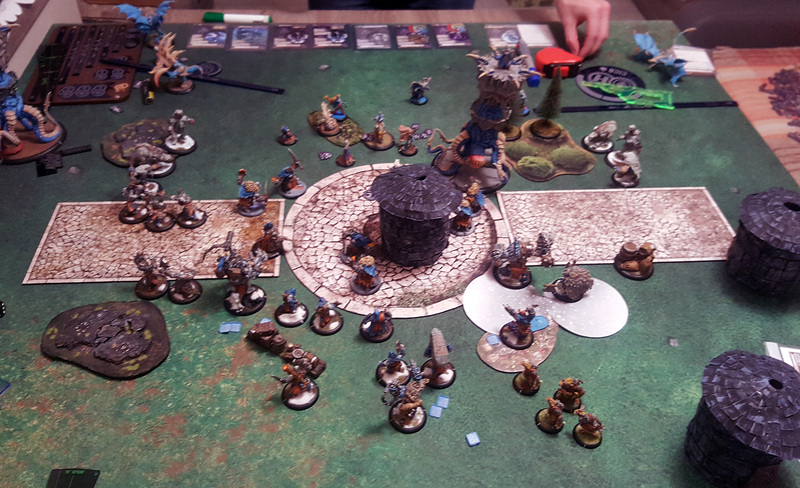 Maciej charged with Hellion and Seraph on Calandra, but she dodge away. In my turn I just killed Throne with Bears, cleared zones and scored 3 points winning 5:0. Afterthoughts: Man, you need to be careful and look if Vayl can get to you! She often can and that is game over. Beffundle – it won me the game. 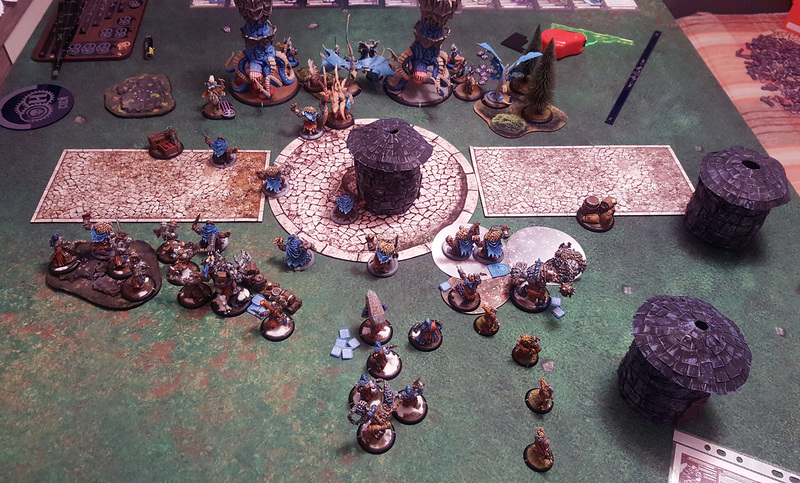 I was able to move Throne and Angelius closer to ambushing Bears. first Ice Witches give pupet master on Throne, Vayl and Angelius. Than Throne take dawn Raider. Vayl hit throne with her snowball 😛 and use him as arcnode. Than use feat and cast all offensive spells and boots what she can. At last Angelius with boundless charge kill Calandra on melee.